12″ x 15″ x 1″, oil on panel, ready to hang. The two paintings today are a search to paint that ethereal light you might find on the coast, the one that beckons you to move towards the sea. 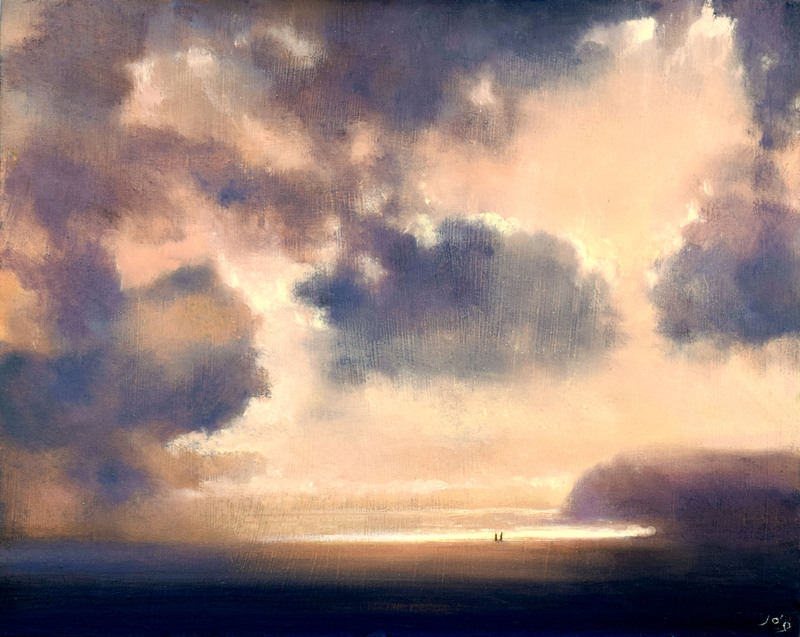 This first painting has that light that signals the sea is there, somewhere, ahead. You know, the one that never fails to excite, every time you want to reach the ocean. It manages to squeeze its way between cloud and horizon, shimmering even on cloudy days. 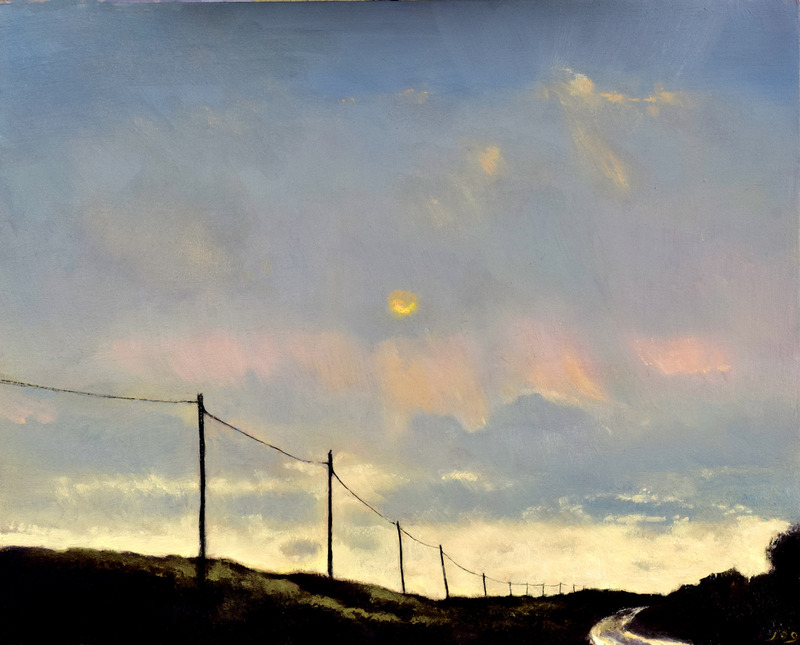 Like in this previous painting, the dark sculptural telephone poles and wire lead us onward. Where will that first sight of the ocean be, over the next hill? This expectation is always a thrill. On the right, the curve of the small road, still wet with rain, catches the lemon light of the horizon. The land is dark and stands out in relief. The point where dark touches light in a painting always adds energy and drama to a piece like here, when solid land touches the aerial. What a joy to paint this! $497 (approx £380, €431) with free shipping. This second piece, ‘The Communion’ is different. The palette is softer, more tonal with a dreamlike quality. The journey along the winding road has now led us to the edge of the ocean. On the shore, a couple is dwarfed by the mighty swirling clouds shifting above them. They are looking up at the wonder of nature, communing in a wonderful moment of reverie. The turbulent sky is flooded with light, filtering through the clouds and onto the sea below. Most of us have had one of these special moments though. Please tell me about yours. I am struck by the relationship and contrast between these two paintings — stark/soft, solid/ethereal, anticipation/fulfillment — and with my emotional response to each. The first, with its winding road, limpid sky and dark earth, pulls me forward toward that beautiful glow, the promise of the sea. It feels (not to force the metaphor) like the journey through life, the movement through a dark landscape toward something we can feel but not see yet. It knocks me out; it moves me terribly, in a very visceral way. The second seems to me like a vision of heaven, if such a place existed, and brings me nearly to tears. It feels like a reunion with those lost to us, or even with a natural world from which we have become estranged. It’s a journey into another dimension, or “through the veil,” beyond illusion. I have had both experiences — certainly while I was living in Ireland, as well as at other moments when I felt suspended in time and place. Beautiful work, John. Both works are beautifully painted John and infused with emotions which perhaps can best be expressed visually and are much harder to put into words. In the first one, the low viewpoint and rising, shimmering lane emphasises the sense of striving forward – onwards and upwards towards the light , that wholly natural and human desire. The other has a sense of satisfying completion and almost elicits an audible sigh as we marvel at the wondrous sky evoking otherworldly sublimity; we are literally taken to another plane. For me the title ‘Communion’ encourages my feelings of connection: with each other, with nature, with memories of people, times and places gone by. Isn’t is incredible that art can do this? Isn’t it incredible too to have a store of such memories to draw on. Yes It’s very true what you say, sometimes a picture can express more than words can say. Thank you for your poetic thoughts on the paintings and which I very much agree with. I did hum and haw over the title ‘Communion’ as it of course has Christian connotations, where as the painting is an expression of spiritual connection to nature and each other, perhaps pantheistic. Yes you are again quite right memories are always with us and can be vivid and a powerful aspect of making paintings. Copyright © 2018 John O'Grady Art | All rights reserved.